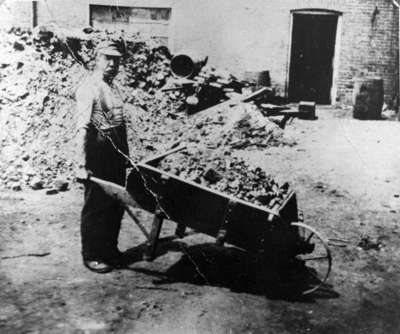 A black and white photograph of Perry Johnson wheeling coal in a wheel-barrow at the tannery. The tannery was one of three main industries in Whitby during the early 20th century. Whitby’s main industries at this time were a buckle factory; blanket factory and tannery. The tannery was in operation from 1863 to 1952. Located at 301 Brock Street South, the tannery was at the corner of Dunlop Street and Brock Street. The tannery manufactured leather goods especially industrial belts used in factories and shoe laces. Founded in 1863 by Joseph and Charles King, the tannery was operated as “King Brothers Tannery”. It was a family business until 1952 and in 1954 the factory was demolished. Wheeling Coal at King Brothers' Tannery, c.1925, Photographer Unknown. Whitby Archives 13-003-001. Scanned from copy negative dated 1973.